* (SEE PREVIOUS POST ON BAND "RABBIT" AND SINGLE "LADY LA DI DA"). In October 1977 ex-Rabbit band members, Jim Porteus, Mark Tinson and Phil Screen recruited Peter De Jong and renamed themselves Heroes. Heroes based themselves in Newcastle, but signed to the Sydney-based Albert Productions. The band's debut album, "Heroes" (October 1980), yielded the singles "Baby's Had a Taste", "The Star and the Slaughter" (January 1981). Heroes were Newcastle's top rock attraction, with both singles making the Top 10 locally. The album did even better by reaching #1. Heroes other claim to fame is that they were the last band to play at Newcastle's Star Hotel, the controversial closure of which sparked off street violence and rioting that night - Cold Chisel have a song about this event also. Heroes broke up in 1982. 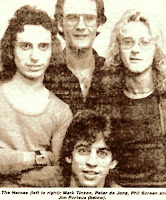 In 1983, Mark Tinson and Phil Screen joined the band "Swanee".